quarrygirl.com » Blog Archive » lookout los angeles, here comes golden road brewing! i attended the opening with my blogging partner in crime brittany, and we were completely blown away by the size of multi-building structure when we arrived. the brewery is made up of enormous primary colored buildings, so it’s super easy to spot from far away. we actually rolled up to the wrong golden road building at first, and had to walk a ways to where we were supposed to be. made it. 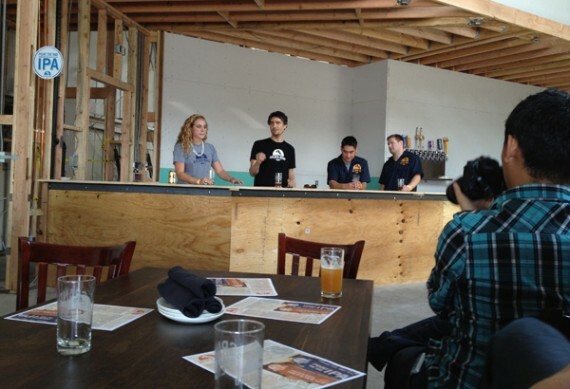 the event started with a casual media conference at the site of golden road’s future brewpub. everyone grabbed a beer from the already-installed tap system, mingled a bit, and then engaged in a Q&A with meg, tony, and jon. they told us stories about how they met, visiting germany to do “research” (jealous! ), and getting the brewery open in such a short amount of time. 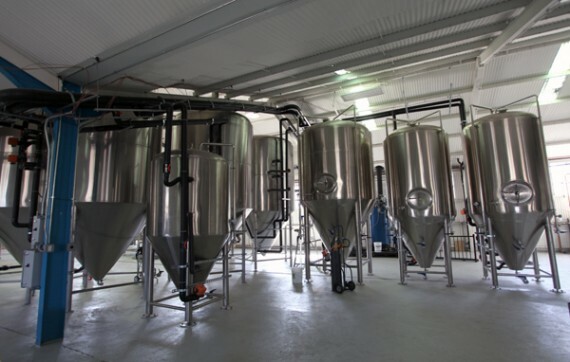 they also shared some pretty exciting immediate plans, which included the opening of their brewpub and the canning of their beers before the end of the year. can’t freaking wait. when the chat was over, we indulged in a vegan-friendly breakfast bar put together by chef randal. 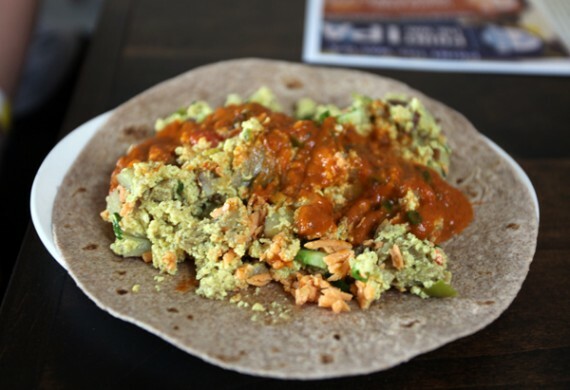 i ate a ton of make it yourself burritos with tofu cheezy scramble and a vat of incredible salsa. you aren’t going to believe this: but the scramble had bell peppers in it…and I STILL ATE IT. what the hell—i usually HATE bell peppers, but this stuff was so good! the peppers were super mild and had lost their texture. it’s almost like they weren’t there. if this is any indication as to how good the food at the golden road restaurant is gonna be, then i’m beyond stoked! after brunch, we got a quick brewery tour (gigantic! gigantic! ), and then joined the public for the grand opening celebration. there were lots of guest craft beers available from other breweries, but i stuck to golden road and loved everything. fun fact: they use agave rather than honey in their hefe to ensure it’s vegan-friendly! 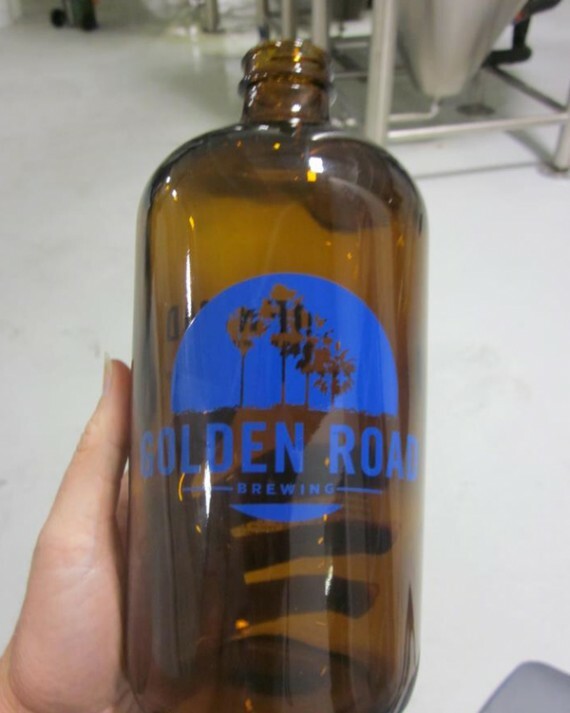 right now, you can find golden road at craft beer bars all over LA. and as of today, you can get growler fills at the brewery on thursdays, fridays, and saturdays from noon-4pm. for up to date info, check out golden road on twitter and facebook. 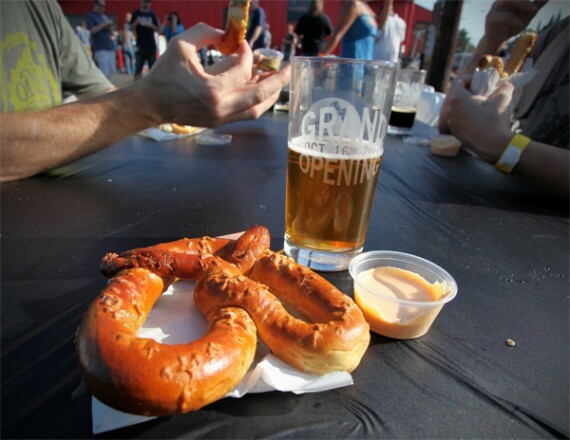 we’ll keep you posted on anything we hear about their soon-to-be brewpub. WE CANNOT WAIT! can anyone drink at the brewery or is the beer just for taking away? Is a growler half a gallon? When your friends are drinking 40s you can pull out a growler and show them who’s serious. wow, love the GR crew but they totally blew it on communicating the pretzels were vegan and the hef is made with agave. 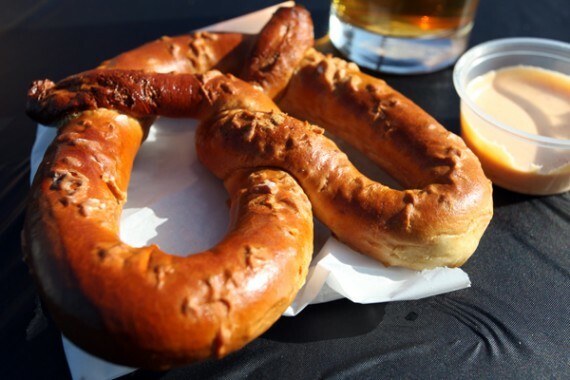 haven’t been able to try the hef for weeks cause of that….and i really wanted to try one of those damn pretzels!!!! perhaps it’s my own fault being that so few breweries are v friendly. do you know if they made the hef special just for the opening or did they finally switch over from honey? wish west LA had places like this. If this was facebook, I’d “like” this. Super excited for this. Probably more than I was for Mohawk Bend. That’s what I was wondering too since I’d been to Tony Darts Away a few weeks ago and the Hef was stated as non vegan… They might have to do a little advertising on that front since I’m sure a lot of other people saw it and might be skittish to try it. Kind of strange they’d be using honey or agave to begin with though after flying to Germany to do “research” on authentic Hefe’s seeing that the Germans use neither. Well this sounds awesome. I’m the only vegan brewer up at Firestone Walker and sometimes feel like an alien up here. The good thing is though that all of our beers are vegan except our honey blond. Seems odd that they would use either honey or agave in a hefeweizen to begin with (though I think agave would technically be allowed in germany under the reinheitsgebot because it is a “pure” sugar) but I’ll have to see for myself. The smoked IPA sounds delicious but I think smoked everything sounds delicious. I’ll be coming down to LA next weekend and I’ll try to stop by. Vegans are pretty sparse in the beer community (which tends to worship bacon on the whole) so it’s nice to see people out there going for it. I’ve been thinking about a vegan brewpub for awhile now, so it will be interesting to at least see how they do as a vegan-friendly place.